Barilzar is a powerful Dunmer mage who lives in Morrowind at Barilzar's Tower. 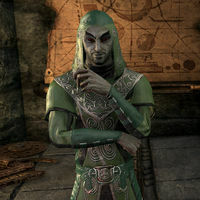 He assists you in helping Vivec by inventing a tonal inverter to counteract the power of Sunna'rah and by gaining you access to Sotha Sil's Clockwork City. As a reward for helping stop Barbas's plot, Vivec gives Barilzar a bag of gemstones- each containing a fraction of Vivec's divine energy, for Barilzar to use studying portal magic. Barilzar is a former apprentice of Sotha Sil, and is constantly referencing the Great Gear. He had multiple laboratories in the Clockwork City, and was one of the few people who knew how to leave it. He is also very interested in clockwork devices and Dwarven constructs. During the quests Divine Inquiries and Divine Intervention, he works on a chronochromancy experiement (studying the correlation between color and time), invents a tonal inverter out of scrap Dwarven parts, and can be seen tinkering with a Dwarven spider. Barilzar is a bit scatterbrained and talks about having misplaced tools and even his own hirelings. He has had multiple hirelings in the past, who, according to them, have all stopped working for him because he sends them into incredibly dangerous ruins and shows little regard for their safety. These notes should be helpful. Can I ask you a few more questions? More questions? Well, Lord Sotha Sil attributed curiosity to intellectual superiority, suppose I should do the same. Ask, and I will attempt to tighten the cogs of your ongoing education as best I can. That tool you mentioned, is it a weapon? Odd question. Is a hammer a weapon? A saw? A Dwemer spring spanner? No, it was just a tool, a device crafted by Sotha Sil to aid in his endless experiments. I suppose I could imagine ways to modify the device, but for what reason? Hmm. Do you know where the tool is now? Haven't a clue. Tools have a way of wandering off when you don't stay vigilant. Had a guar that used to swallow tools when I wasn't looking. Glowed for a month until the enchantment dissipated and the tool passed. Should have heard the screams…. You worked with Sotha Sil? I was his apprentice, but that was years ago. Spent time working in the Clockwork City. That's where I learned about energy transference, Dwemer engineering, mechanical symmetry—made me the Dark Elf I am today. But I have a question. Who sent you? The Archcanon? Lord Vivec's high priest? Suddenly the gears align …. I can think of a number of reasons that ALM and VI would want to know about SI and his tools, but some doors just shouldn't be opened. Tell me more about Sotha Sil. He's the Father of Mysteries and the Architect of Time. One of the Tribunal, the three Living Gods of the Dark Elves. Creates all sorts of helpful and intriguing devices, like the Clockwork City. I haven't seen my old master in many years. It's a wonder and a miracle, all brass tunnels, glass domes, and giant gears. He was inspired by the work of the Dwemer, but the Clockwork City is pure Sotha Sil. He made it to forge the future and reshape the world. I learned a lot there. Where can I find these hirelings of yours? Hirelings? Yes, they worked for me. Before they quit, ungrateful netches! Still, I paid them well before the pistons slipped their alignments. They should know where to find the components. Last I heard, Snorfin and the others were in Molag Mar. Do you think the Daedra will return to trouble you? The situation is wound dangerously tight, but I believe the gears revolve around you. Once you leave, I should be perfectly safe. Or, at least as safe as I ever am in the midst of all these experiments. You however …. Stay vigilant, my friend. Can you tell me more about these components you need me to find? I could, but I won't pour five-year-old flin into a cracked decanter. No offense. Suffice it to say, they're fairly common as far as Dwemer components go. Use the list and talk to my former hirelings. I'll build the device the moment you return. Look at the craftsmanship. The attention to detail. Sotha Sil is a true master. Amazing, isn't it? Such intricate work on something so small. Well, are you ready to go inside? That's the Clockwork City? It's so small! Precisely! Oh, I see your concern. Forgot you haven't been here before. Use the entrance and you'll shrink down and get drawn inside. I understand that some of Sotha Sil's first entry methods had unintended effects, but now it's perfectly safe. But why is the Clockwork City inside a globe? Where else would you put it? Besides, once we get inside, it's much bigger than it looks. My former master said that working in miniature enhanced his precision. And it made it much more convenient to hide away and store. I'm not sure I understand the purpose of the atelier. As I said, the atelier's the workshop where Sotha SIl used Sunna'rah to experiment with his own divine energy. The reservoir located inside was specifically designed to contain such massive power. As far as workshops go, it's a masterpiece! How much longer do I need to stay here? Social situations have never been my strong suit. I want to get back to my tower and experiment with this wonderful gift Vivec bestowed upon me. I already have ideas on how to improve magical transportation! Barilzar appears as a lich in Tribunal. In the Clockwork City, Alarvyne Falas has been archiving Barilzar's research from his laboratories and mentions him to be a powerful mage. This page was last modified on 28 October 2018, at 11:20.